As an undergrad the same question is always asked for every scientific project I do or study: “why is this important?” This question is the bane of undergrads because the answer usually lies in whatever lesson the professor is trying to teach us but we can rarely read their minds to know what answer they are looking for. Every time a new project is assigned I know the question is coming, and I cringe knowing I will not have the right answer. I know in science everything has a reason, but can’t the answer for once just be because someone somewhere was interested? Recently I have discovered that this horrible question really is in fact crucial to science and does not necessarily have a right or wrong answer like it does in the classroom. Through my experiences this summer, and especially here on the IRES trip, I have discovered that asking why something is important depends on who you are and what information you want to receive. As a researcher, this question may mean why is this project important to the furthering of the scientific knowledge? To the student learning, this question may mean why is this project important to your schooling and what can you learn from it to help you in the future? And to the general public, this question may mean how does this project impact me and why should I care? All of these versions of the dreaded question need to be answered. What I have learned is that the question the general public is asking is the most important to answer. As I said before, I always want to say a project is important because I am interested in the results. But I am the one who came up with the project so of course I am interested but why should someone else care? Science can have an impact on people’s lives, and they have every right to want to know what specifically is going on. This is why the dreaded question is necessary; it is human nature that we want to know. Being here at Lough Hyne has opened my eyes to science and the general public mixing. Every day locals and visitors alike come to swim in their favorite spot, kayak through the smooth water and gaze at the beautiful landscape, hang out and catch up with friends, and snorkel the waters to enjoy wildlife in its natural habitat. Right alongside them are the scientists turning over rocks to see what’s below, snorkeling the lough to document algae movement, searching for urchins to estimate population size, and us conducting our own projects to better understand the ecology of the lough. Science and enjoyment coexisting in one beautiful place. Every day when we don our snorkel gear or are just getting out of the water, locals approach us to ask how the lough is doing, what the urchin population is like, and what we are studying here. Everyone seems to be genuinely interested in what we are looking at and amazed that even with how greatly studied the lough is that students can still find things to look at and learn from. As an undergrad, this gives me hope that something I am doing actually does matter and is important. It is important to the community that lives here and travels here. It is important to those who care about the lough and want others to enjoy it just as they have. It is important to those who came here as children, who knew the lough as being abundant in sea urchins and want to know why they have all but disappeared. 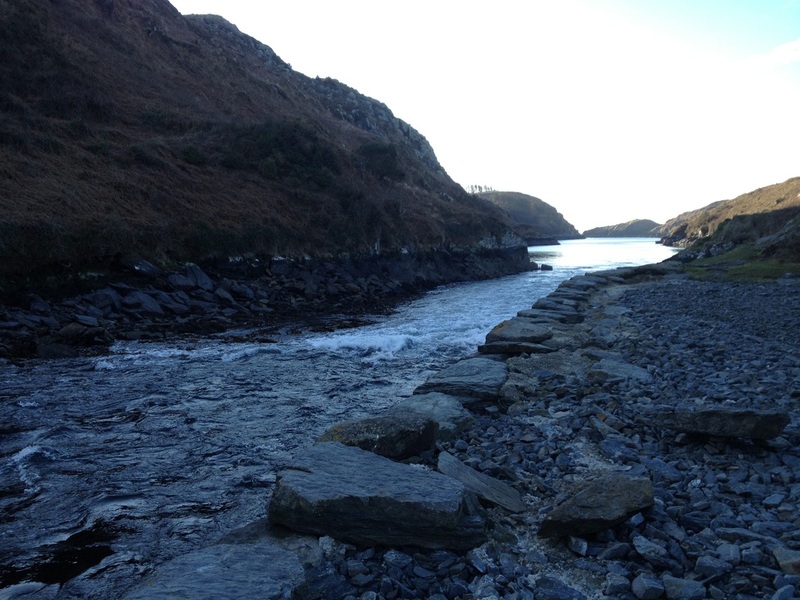 The work we are doing here at Lough Hyne is a continuation of the work that has been done here for almost 100 years. How amazing is that? Scientists have been able to study this one area for nearly a century and there is still more to learn. That in itself makes IRES important; we are continuing the tradition of research here and striving to help the public understand marine life. For all of us studying here, we have different answers to the infamous question. We have the answer that helps further the scientific knowledge; we have the answer that teaches us a lesson on research for our future: and we now also have the most important answer for our time here: the reason for why someone should care about what we’re doing. The reason why locals and visitors alike ask us every day about what we are studying. The reason why we get up every day, spend hours in the cold water, do physically demanding work, do data entry until our eyes hurt, and why we love every minute of it. Our answer is simple: this is important because we are interested and are encouraged by those around us (whether local, visitor, or mentor) to help the lough in any and every way we can. Me lifting rocks for my project. 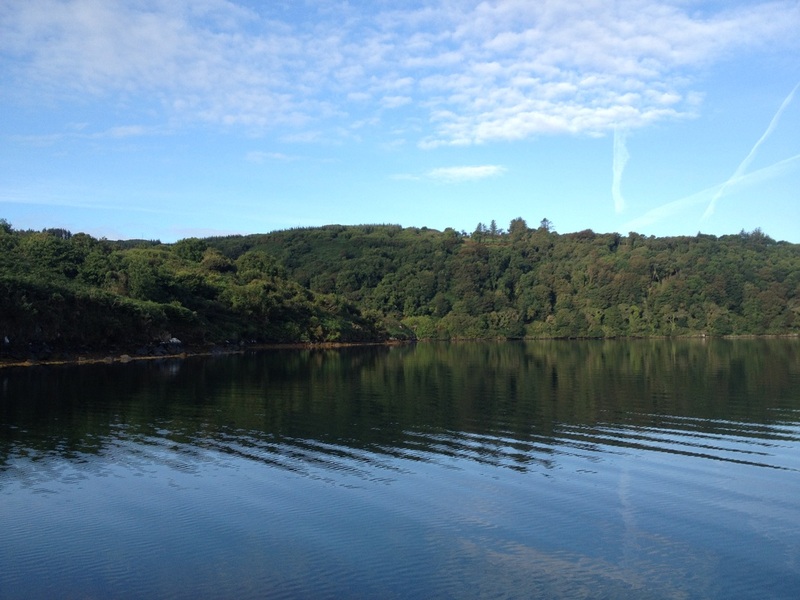 As many of the other IRES 2014 team members have already stated in their blog posts, this experience at Lough Hyne has been more than any of us could have ever imagined. We have been given so many new opportunities, many of which were not expected in the least. Being that the program is a research based, many of us were anticipating that most of our gained knowledge would be related to science. However, that is definitely not the case. I think it is safe to say that we all feel that we have gained much more than a new perspective on science. We have gained a new perspective of the world and the cultures within it, all thanks to the IRES program, Lough Hyne and the wonderful people of West Cork, Ireland. With that, I would like to share a perspective of my own with all of you. Over the course of the past four weeks, I was given many opportunities to foster my passion for photography, and thus have many photos from all of the aforementioned experiences at Lough Hyne. I only hope that they have captured enough of the lough’s spirit and beauty to captivate you as much as the lough did all of us. A trip to the Dunmanus urchin hatchery during the beginning of the trip taught us a lot about the life history of Paracentrotus lividus (the illusive purple urchin), as well as the culture surrounding seafood in West Cork, Ireland. 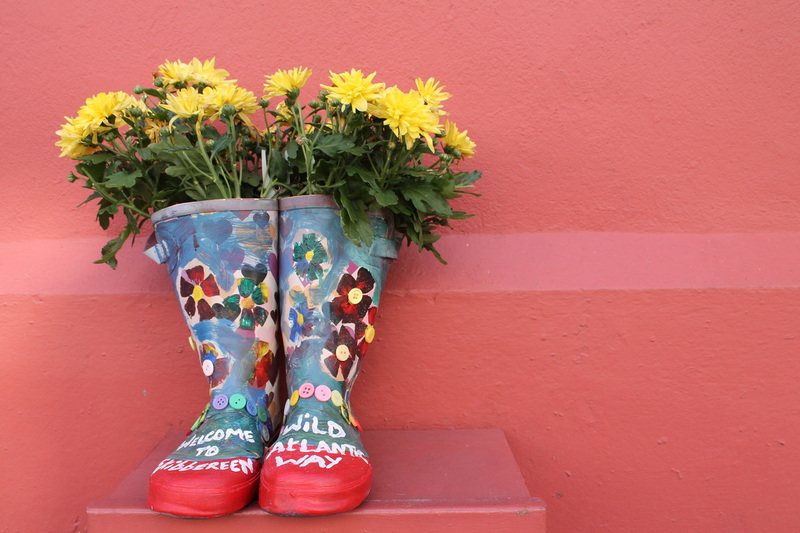 During one of our many trips to town for groceries I stumbled upon this delightful display of welcome outside of the Skibbereen tourist center. None of us will ever forget our experience in the “Wild Atlantic Way”. For some of us, the Saturday market was a highlight of the trip. Not only was it a place to purchase delicious food, it was also the social center of every Saturday in Skibbereen. The crowd wasn’t much unlike the one that these ducklings were experiencing. During National Heritage week, we were given a chance to learn about the history of Lough Hyne on a walk with Terri Kearney, a coordinator at the Skibbereen Heritage Center. The weather couldn’t have been better, though the steep inclines of the many consecutive hills made us wish for a cooler temperature. One day, after many hours of hard work at the microscope, I found myself with a few hours of free time during a beautiful moment of sun just before sunset. I took it as an opportunity to go for a walk and take some photos. Just as I was returning from the walk (with very few photos to be proud of), I stumbled upon this gray heron, which seemed to be very comfortable with me approaching it. 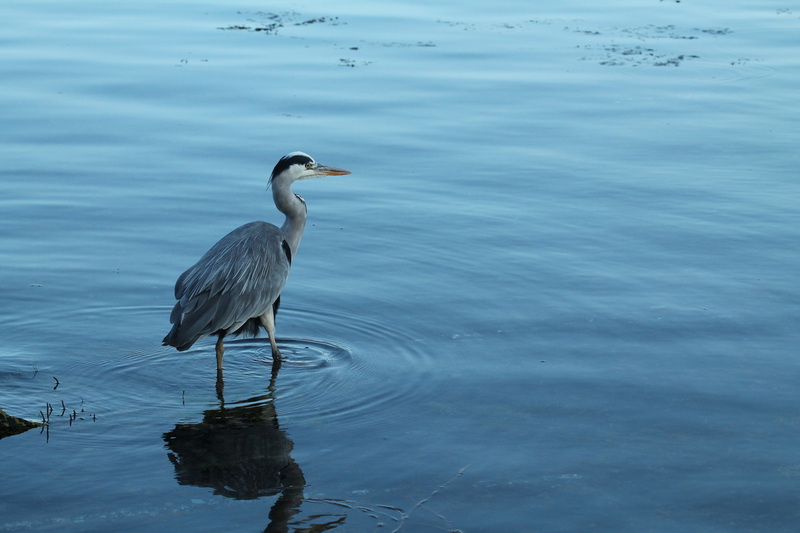 Turns out, this particular heron was rehabilitated and returned to the lough a few years ago and can be seen fishing at this very spot almost everyday. 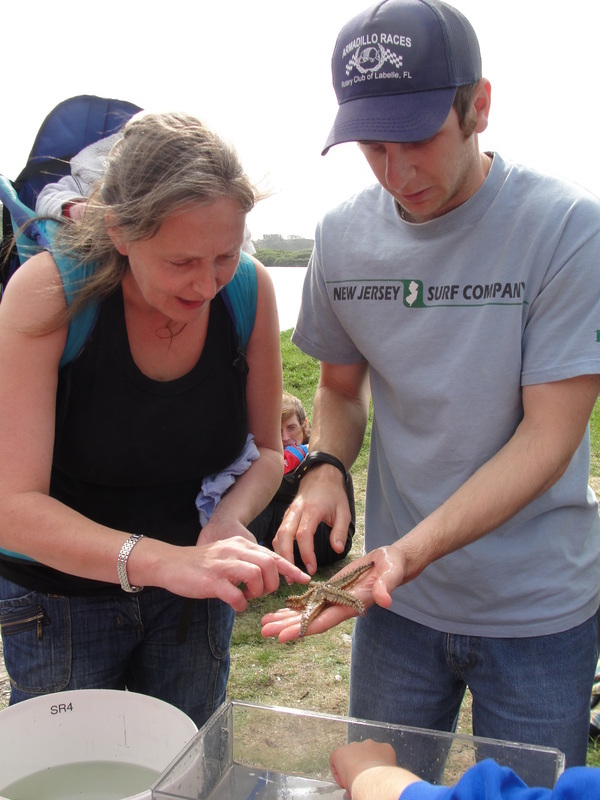 During the annual touch tank event held during National Heritage Week, we were able to give back to the community by teaching them about the wonderful array of life that can be seen in lough every day. These two children seemed to be particularly interested in (and slightly afraid of) the velvet swimming crab, which is also known as the devil crab for its bright red eyes and, dare I say, crabby demeanor. One of my personal favorite moments of the program was our sailing trip around Baltimore. 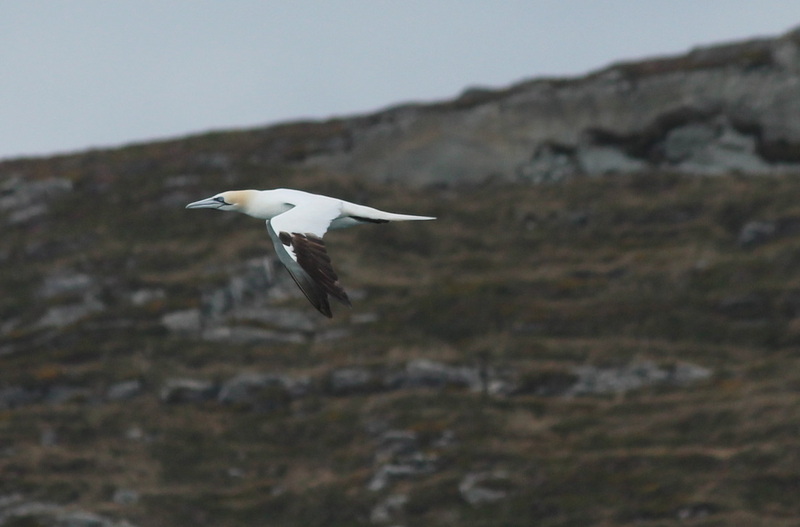 We saw many seabirds, but none of them can compare to the Northern Gannet, which dives straight down from spectacular heights to forage for its food. Though it’s not always easy to spot the bird while it’s in the air, the splash that it creates during a dive is nearly impossible to miss. During another trip to Baltimore, we had a chance to visit the Dún na Séad Castle, which is most well known for its ownership by a clan of pirates, the O’Driscolls, in the 1400s. 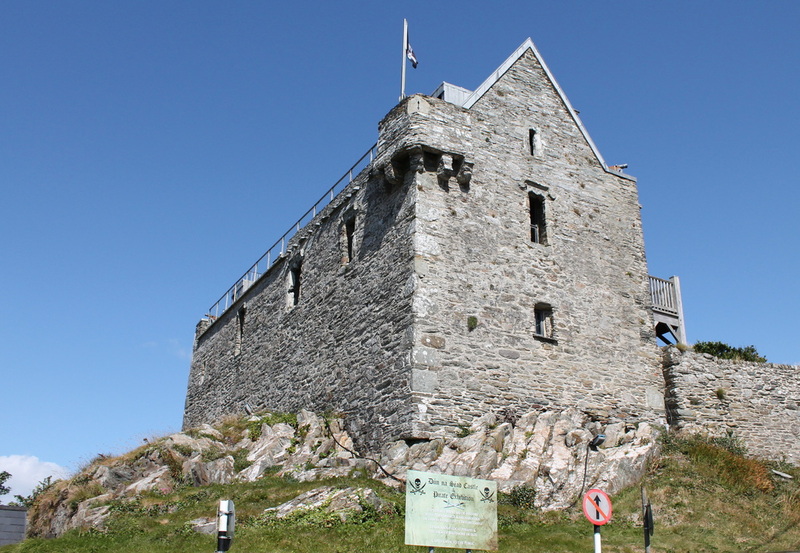 The current owners of the castle, one of which is a descendant of the O’Driscoll clan, have renovated the place, living in one half and showing the other as a private museum during the summer. Tomorrow we start our journey home with some sightseeing and a stay in the Cork Airport Hotel. We are all excited to see our fiends and family again and to tell them all about the wonderful experiences we have had over the past month, but I think we will all miss Lough Hyne. This is a poem that is on display at the Skibbereen Heritage Center that I think perfectly describes Lough Hyne’s beauty and how I feel about the lough. And no voice, save mine, disturbs the strand. And his craggy sides are wooded well. A castle of old is darkling seen. Were hung, when the owner in sleep reclined. Would rise, with anger and shame again. Shines like a tear at Friendships grave. Murmurs in fragrant breathings o’er. Of the ancient Kings of Araby. Ere I would leave thee - loved Lough-Ine. Fitz-James O'Brien 1828 - 1862. We have finished collecting our data and we have given talks presenting some results from those data, but even though we are now leaving, we are not done with the lough. We do still have to write up formal reports and most of us will travel to conferences to present our results, gaining even more amazing experiences from our time here. Even when the science comes to and end, I think I will always feel a pull to come back to this place and I would love to bring some of my family here and show them how amazing it is. I will always have fond memories of my time here and a special place in my heart for Lough Hyne. 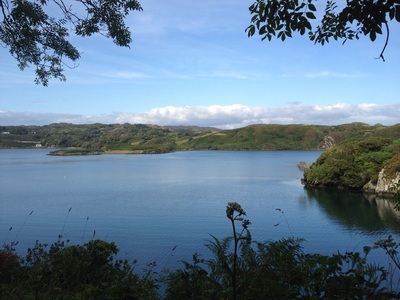 Note: The poem says Lough-Ine and we call it Lough Hyne. Both are correct and there are numerous other spellings. Lough Hyne is changing. The North Basin shores, which were historically dominated by the purple urchin Paracentrotus lividus, are now covered in towers of ephemeral algae. The population of Paracentrotus collapsed in 2000 and since that time, several species of algae have increased in abundance and begun a northward migration within the lough. One of the questions we’ve begun to explore is what other organisms might be present that could fill the ecological gap left open by the absence of the urchin. In other words, what else might eat the algae? This seemed like a pretty straightforward question at first, but it turns out to be more difficult. For the last several years, Dr. Cynthia Trowbridge and colleagues have been surveying the lough and documenting the presence of urchins. The results are dismal. More recently, I outplanted pieces of algae around the lough and documented grazing scars (indicators of some type of grazing organism). Now the tricky part is figuring out what animal caused the damage, particularly in areas where urchins have not been observed for some years. To begin to unravel this mystery, I collected organisms that have either been observed on algae or are known to consume algae, at least as part of their diet. The goal is to begin to develop a reference of typical grazing scars induced by different organisms which can then be compared to the damage observed in the Lough. So far the most likely candidate remains the purple urchin, but the search continues. One of the candidate organisms is the shore crab Carcinus maenas. These crabs are omnivorous. They have been reported to contain both animal and plant material within their guts, suggesting consumption of plant material. However, these crabs are non-picky eaters. It remains to be determined if these crabs are consuming live and healthy algae, or simple rotting pieces. 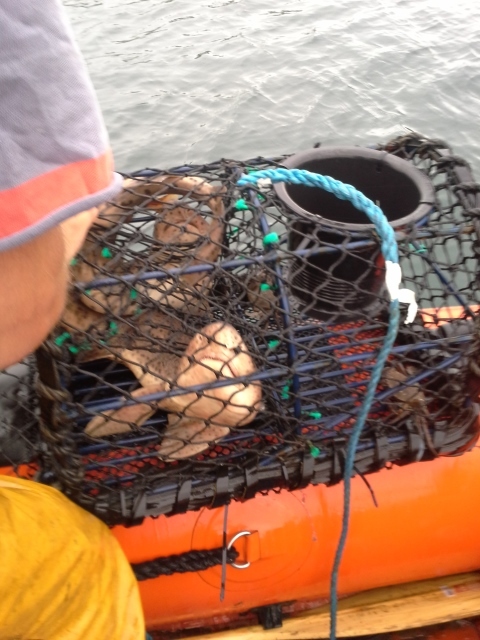 And so we put out some crab pots, baited with fresh mackerel, to catch some Carcinus. The first try resulted in prawns and gobies, neither of which are suspects in this mystery. 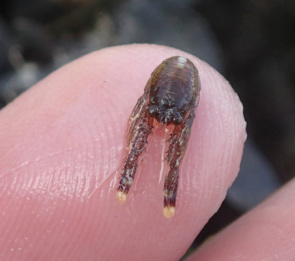 The second try resulted in many shore crabs, but all of which were either missing claws or infected with a parasitic barnacle, Sacculina carcini. As fascinating as these parasites are, they are known to alter in some degree the behavior of their host crab, and thus made the crabs ineligible for use in feeding experiments. That’s two strikes. We refreshed our pots with more bait, and deployed again. This time was far more successful. The first pot contained the swimming crab Liocarcinus arcuatus, which is another species of interest, so we considered it a win. As the second pot rose out of the water, I heard an exclamation of excitement. 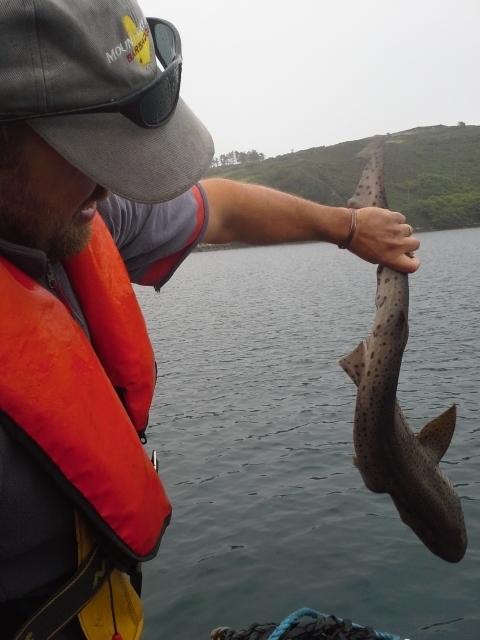 Expecting to see a bounty of the shore crab we were hunting, I was surprised instead by two large bullhuss, or large spotted dogfish Scyliorhinus stellaris! Our crab pots caught two sharks instead of crabs, last thing I would have guessed would be in the pots. But there they were, and the mackerel bait was not but a head and spine, everything else licked clean. We of course immediately released them and watched them swim away, back into the depths of the Lough. And our third pot? Carcinus jackpot. But no sharks. I’m not quite sure how it happened – in fact, I at one point tried to actively avoid it – but it is now impossible to deny. I am a gastropod enthusiast. I love snails and slugs and have from a young age. I have distinct memories of walking ahead of my parents and scanning the walkway from the car to the door of the house to make sure they wouldn’t inadvertently squash any snails. As a graduate student I had planned to avoid studying snails. Instead, I find myself studying marine snails and squealing for excitement when I see an unfamiliar species or a cool color morph or interesting behavior. 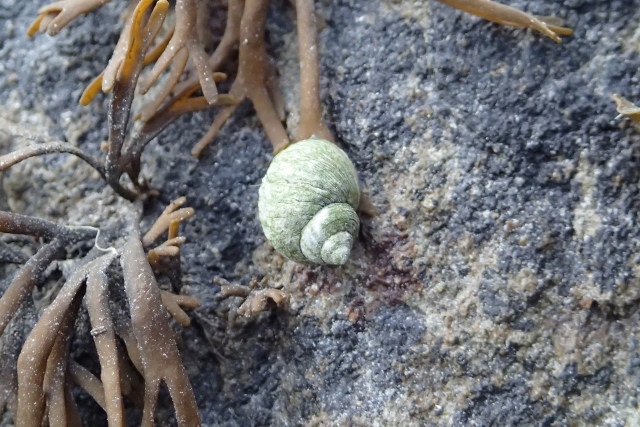 As it turns out, Lough Hyne has no shortage of gastropods. 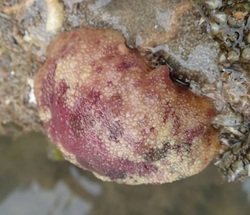 Without even having to get wet, you can find at least half a dozen different species of marine snails in the intertidal zone: up to 4 types of winkles (the edible, rough, flat, and smooth winkles), 3 types of topshells (the grey, flat, and toothed topshells), a dogwelk, and 2 limpets. If you go underwater, into the subtidal zone, the number of potential species you might encounter skyrockets. There are cowries, blue-rayed limpets, snails reaching maximum sizes of only a few millimeters (such as Rissoa parva), miniature sea slugs like Doto coronate (almost too small to see with the naked eye), blue and bubbly sea slugs (Janolus cristatus), and ‘sea lemons’ (the sea slug Doris pseudoargus). And these are just the common snails and slugs. Every once in a while another critter shows up. And when it does, it doesn’t disappoint. Rough winkle, Littorina saxatilis, commonly observed on the high shore. This year an aggregation of an unexpected slug, of the Order Cephalaspidea, was found within the lough. Animals within this group are morphologically halfway between a snail and slug (at least as we commonly think of them); snails have a shell which they grow, carry, and live within; slugs lack the shell to protect their soft bodies. Cephalaspideans retain their shell, but in a reduced form, generally as a flattened oval piece at the posterior end of the animal. One species within this order has been commonly observed for many years: Philine aperta. 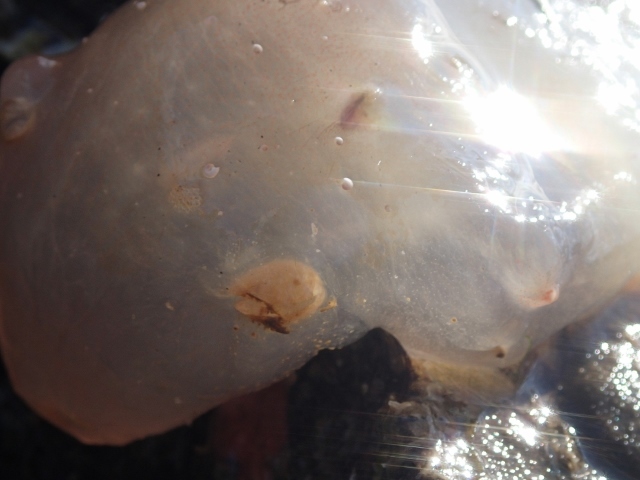 These white, semi-translucent animals can be found burrowing into sandy or muddy sediments in search of worms or small bivalves to consume. Less commonly observed—one not seen in large numbers for nearly a decade—is Akera bullata. 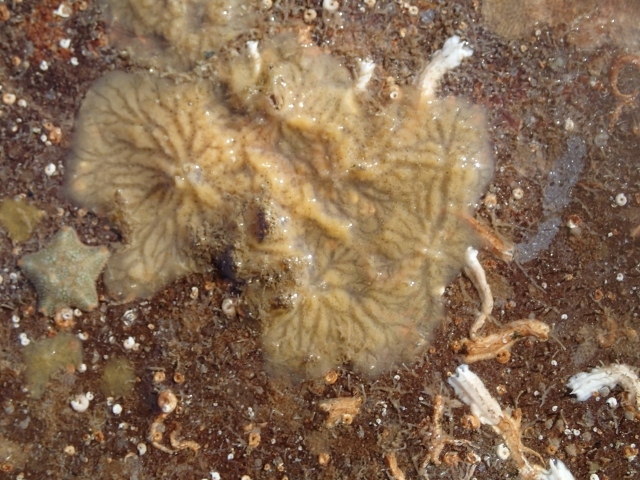 Like their relative Philine, these organisms are also found on soft sediments, but the list of similarities between these two organisms is short. These animals are herbivorous and have the ability to swim. Picture a ray or skate flapping its “wings” to smoothly glide through the water. In similar fashion, Akera swims using enlarged fleshy lobes. According to researchers Dr. Colin Little and Penny Stirling, these incredible animals were once observed swimming in a swarm in the lough. While I didn’t observe any swimming, I did see an equally fascinating aggregation. I first noticed a bubble on the bottom of the seafloor. Then I saw a dark purple sausage shape, Akera. As I looked around I started seeing more and more of these bubbles and purple slugs, hundreds in fact. After several minutes of dumbfounded staring, I realized I was observing a mating aggregation. In some cases I could find an individual and follow its mucus trail in the mud to another individual that was creating these mucus bubbles. All cephalaspideans create characteristic mucus bags attached to the sea floor, resembling little balloons, in which they lay their eggs. These hermaphroditic (each individual has both male and female reproductive organs) animals will form mating groups in which they exchange sperm to fertilize their eggs. I can’t say how many individuals you might theoretically observe, but I saw groups of up to four individuals mating simultaneously! The mating aggregation was brief. A week later egg masses could still be found, but the adult Akera had dispersed back to their feeding grounds. 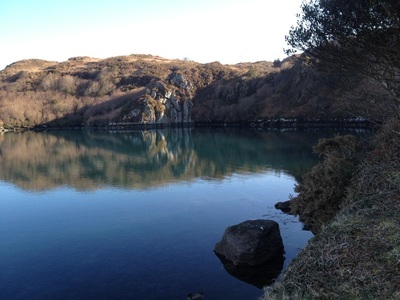 It just goes to show that there is always something new and exciting to discover at Lough Hyne. 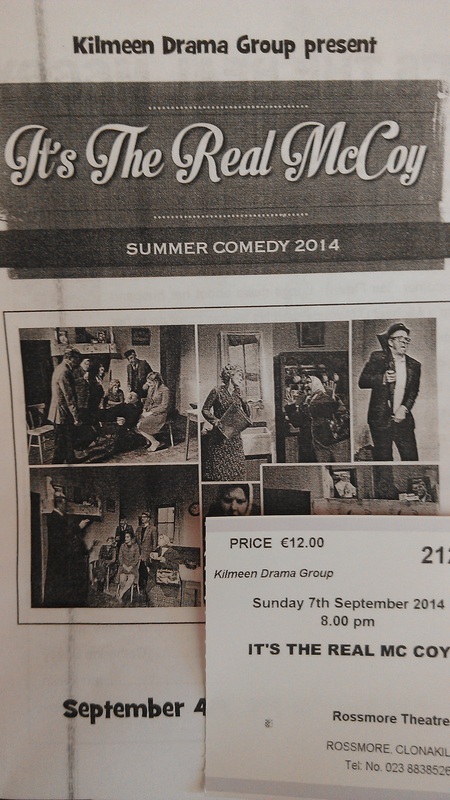 One of my top non-scientific goals for this very scientific trip to Ireland was to see some authentic Irish theater. I’m not going to claim to be an actor of any true merit, but I happened to join some plays throughout my four years of high school—so at the very least, I have developed a love for theater. As one could imagine, I was getting a bit nervous when we entered the last week of our time here in Ireland without having seen a play. My wish was granted this past Sunday when we traveled to Rossmore, Clonakilty to see the Kilmeen Drama Group put on It’s the Real McCoy. It chronicles the return of a husband to his wife forty-three years after leaving without warning. The (very justified) bitterness of the wife, Madge Molloy, spills out onto her daughter, neighbors, and even the new parish curate in town. Thus, what ensues is a comedic storyline that becomes progressively sillier and more full of slapstick humor—right up the alley of someone like me who grew up watching re-runs of The Three Stooges. The evening definitely got off to the right start when they played the Irish National Anthem before the play. I wanted an Irish experience, and it doesn’t get more authentic than hearing an auditorium of people sing “Amhrán na bhFiann” (especially considering I always tear up during the singing of any national anthem). Once the show started, I was initially impressed with the detail of the set: a working sink in the wall, two windows with space on the other side to represent “outside,” and the rectangular-shaped faded marks on the wall when an old picture was taken off of it. At one point, through one of the windows, I even saw a butterfly flying past “outside,” although I imagine that was just a nice coincidence. One thing that confused me was the choice of putting a picture of John F. Kennedy on the wall above the stove. Perhaps it was because he was the only Catholic president in U.S. history, but I don’t know to what extent the average 1960s Irish person cared about that. Something that deserves special recognition (pay attention, American theater “higher-ups”) is that tea was served during the first intermission. Just about everybody filed out of the theater and into a gathering hall where one could grab a nice cup of tea (or other beverages of choice). Not surprisingly, the amount of mingling, slapping of arms, and boisterous laughter suggested these people all knew each other. This, of course, is the Ireland I was hoping to see: a small town feeling, with no one in a hurry, getting together and laughing over the oddities of Irish culture—whether it’s the unmatched importance of a turf spade or the double standard of the insult-repent-repeat Catholic. And, in classic Irish fashion, the conclusion of the play (and the night) was capped by a sobering, but still happy ending that brought everything together into a strong narrative. If one thing is certain, it’s the infectious nature of sitting in an auditorium full of West Cork residents while watching a play unfold. I left that place feeling sociable, silly, yet deeply introspective. As I was walking out of the water after completing a survey of the historic Renouf sectors (first delineated in the early 1920s), I was stopped by a visitor to Lough Hyne. She asked if I’d seen much in the water, which of course I had. 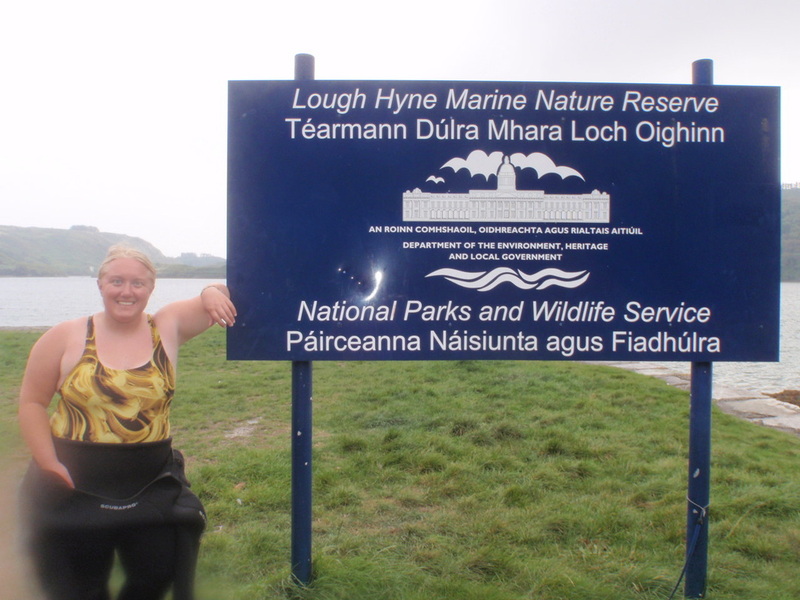 She went on to tell of how she’d heard so much about the diversity of Lough Hyne and so went out and bought a snorkel set to see it for herself. Excited and armed with her gear, she jumped in the water and began her snorkel around the North Basin, only to be sorely disappointed and find that she saw only sand and old shells. And so she asked me, where do you find the bounty of animals reported within Lough Hyne? Amongst the rocks. Any animals out in the open are at risk of being spotted and consumed by a predator, so most animals hide. As a result, a casual swim may not, at first glance, reveal much life. But if you slow down and start to look in the crevices between rocks, under ledges created by rocks, and amongst the algae covering the rocks, you’ll start to see more life than you would expect. In fact, one of the most plentiful and densely inhabited areas is actually underneath and on the bottom of rocks. The tight space between the bottom on the rock and soft-sediment beneath limits access of larger predators, providing refuge for smaller or more vulnerable organisms. Often, juveniles of more mobile animals, such as crabs, will be found under rocks, hiding until they outgrow the space and hopefully are large enough to evade predators. Other organisms will inhabit these types of spaces for their entire lives, such as the squat lobster Galathea squamifera. Of course, that plan doesn’t always work out. Some predators also have adapted to inhabit the underside of rocks. 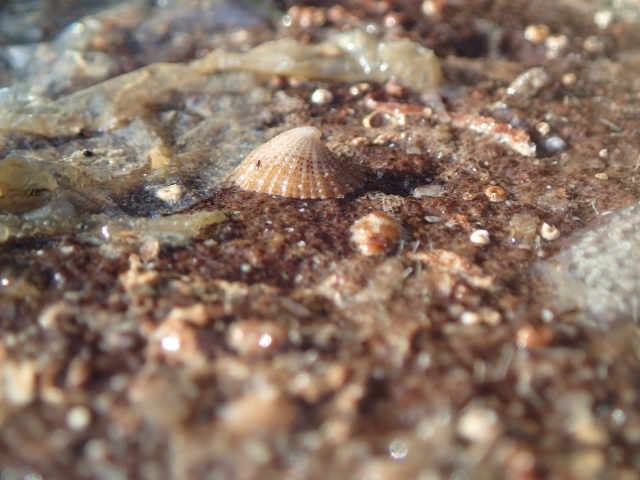 For example, the predatory limpet, Emarginula fissura, can be found under rocks, feeding on sponges. Of course, there are challenges to living under a rock. Mortality, particularly for sessile or sedentary organisms (i.e. organisms that don’t move), can be caused by other factors such as suffocation. If sediment collects in the space under the rock, the animals living on the rock can become smothered and die. If water flow becomes too low, oxygen can become quickly depleted by the animals living in the space, resulting in mortality. There are a few animals that are more resistant to these types of environmental challenges. In particular, worms (which can be segmented, ribbon, or flat) are relatively tolerant of such poor conditions. Some worms are able to burrow through soft-sediment and can therefore create an access point to more oxygenated water. Other worms, such as the keel worm Pomatoceros lamarcki appear to be tolerant of low oxygen environments (likely through physiological adaptations). Pomatoceros lamarcki is often the only organism found underneath a nearly anoxic rock. Reduced water flow beneath a rock means not only reduced oxygen replenishment, but also a reduction in food particles passively flowing past. 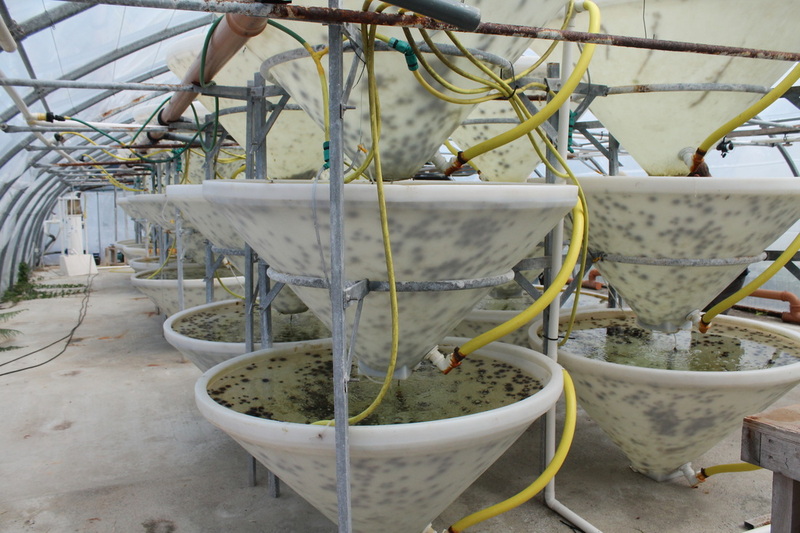 As a consequence, organisms that rely on capturing particles out of the water to feed will be far more successful if they can actively pump water (and the particles within). Not surprisingly, the undersides of rocks are frequently colonized by sponges, ascidians (sea squirts), and bryozoans, representing the most efficient filter feeders. 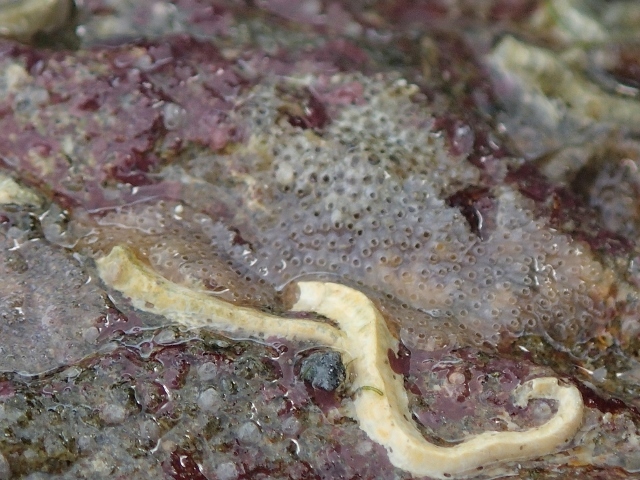 Close up of a solitary ascidian, Ascidia mentula, within which mussels live. With the right adaptations, life under the rocks can be safe and bountiful. Many organisms, mobile and stationary, have developed strategies to take advantage of these spaces, making the space between a rock and hard place not so bad after all. 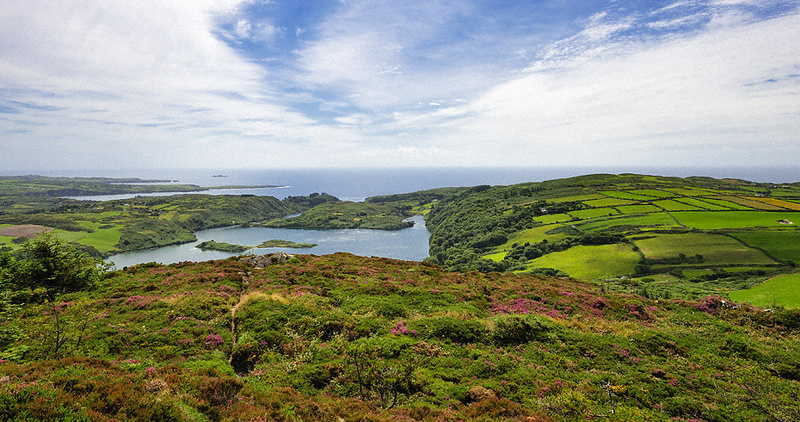 Lough Hyne is renowned among marine ecologists for the rich historical record of ecological research, a rarity in the field of marine ecology. Among the Irish people, it is renowned for its beauty and the diversity of organisms within. 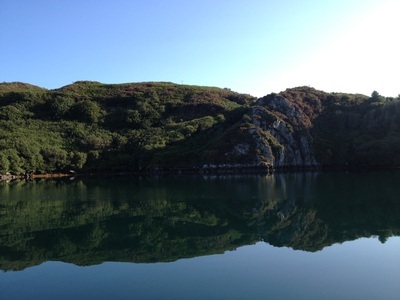 It is these special qualities that led to Lough Hyne being established as a marine reserve (the first in Europe). It is what drives the local community to preserve the lough. It is what attracts visitors from around the country and world. While we are exploring Lough Hyne through the lens of a marine ecologist, researching and digging into how this unique habitat is organized, many other people visit Lough Hyne daily, enjoying its many different aspects. On an almost daily basis we see kayakers and paddle boarders of all ages and skill levels visiting. Lough Hyne creates a protected environment to get your kayaking chops wet and then an exciting ride over the Rapids and into Barloge Creek. Many of these kayakers will also bring their boat ashore and ride through the Rapids with a mask and snorkel, getting just a little closer to the life within the Lough. At night, kayak groups can been seen moving about into the pitch black of night, looking for the bioluminescence of microscopic algae in the water. Locals around Lough Hyne gather for a brisk swim in the chilly (but seasonally warm-ish) waters. Many make it a daily habit, and it is not a rare observation to find a dog swimming alongside its owner. I’ve even heard tell of Lough Hyne being used by at least one individual as a training ground for international open water races. Less serious swimmers of all ages can be found jumping off the North Quay for a quick dip, both with and without a wetsuit. Inspired by all the swimmers, I myself took a dip in the lough, sans wetsuit, and swam from our residence at the Gate House to the Kelly’s Quay and back again. I can attest that it is in fact a brisk swim, not for those with low cold tolerance, but a rewarding accomplishment. 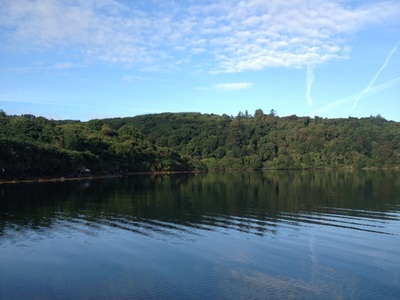 It seems a badge of honor to say you braved and survived a swim in Lough Hyne. 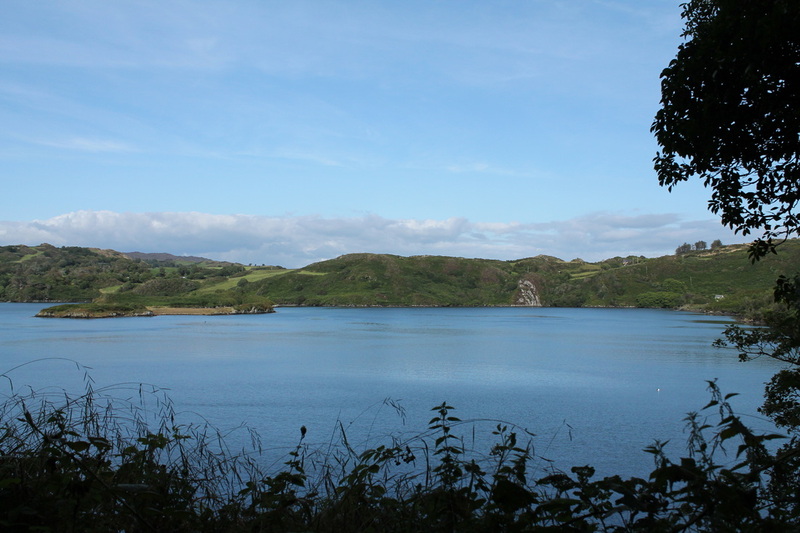 Plenty of visitors enjoy the Lough from the shore, walking along the road that runs around the lough, sitting on a bench to view the birds and fish, picnicking next to the water, or hiking up Knockomagh (or Lough Hyne mountain) for an aerial view of the whole lough. The hike up the mountain takes you through a jungle of trees, vines, and moss, past vista view points, to the top of the mountain covered in yellow and purple wild flowers. In a surprisingly short amount of time, you can go from being at water level to overlooking the entire lough. 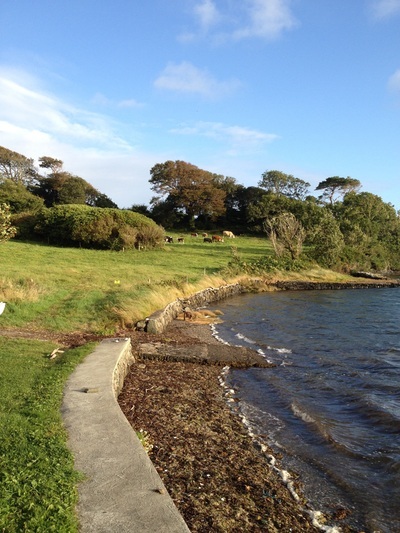 Beyond the beauty of the lough itself is the rich and ancient history of land surrounding it. Remnants and markers of inhabitants dating back to before the Bronze age up to present can be found. If you know what you’re looking for, or have Terri Kearney as a guide, you can take a jaunt through thousands of years in a short 2 mile loop around the lough. Being a marine ecologist, I am of course biased towards the critters in the water and, overall, the incredibly unique world that is Lough Hyne. Within a small area, one finds cold water and Mediterranean organisms, a deep water trough and the rocky intertidal, an underwater mudflat and a kelp bed, and over 100 years of research. 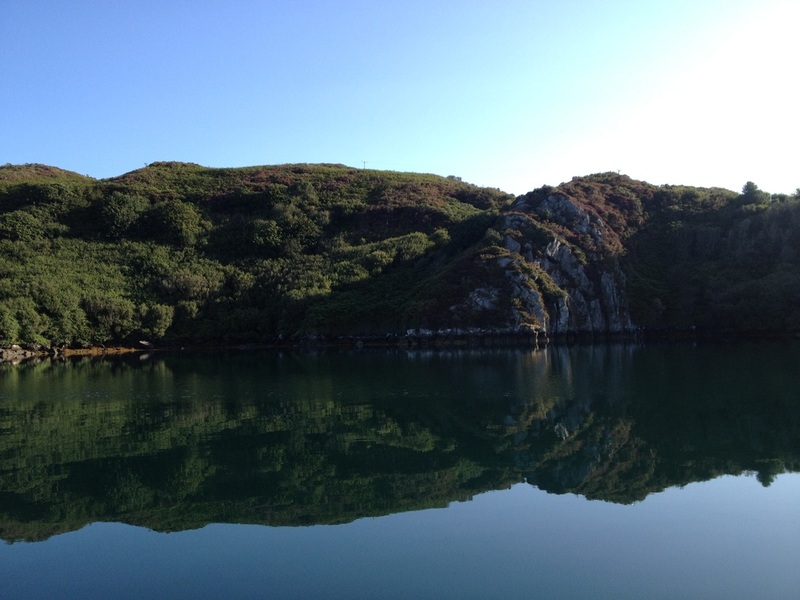 But truly the beauty and magic of Lough Hyne is the untold treasures it holds, the countless ways it can be enjoyed, and the innumerable lenses through which Lough Hyne can be explored. 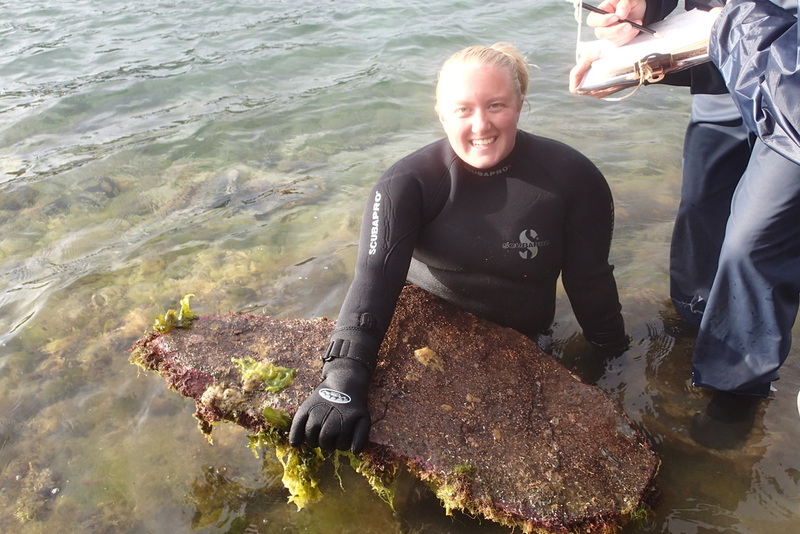 Seastars, Sea Urchins, Sea Squirts, Oh my! 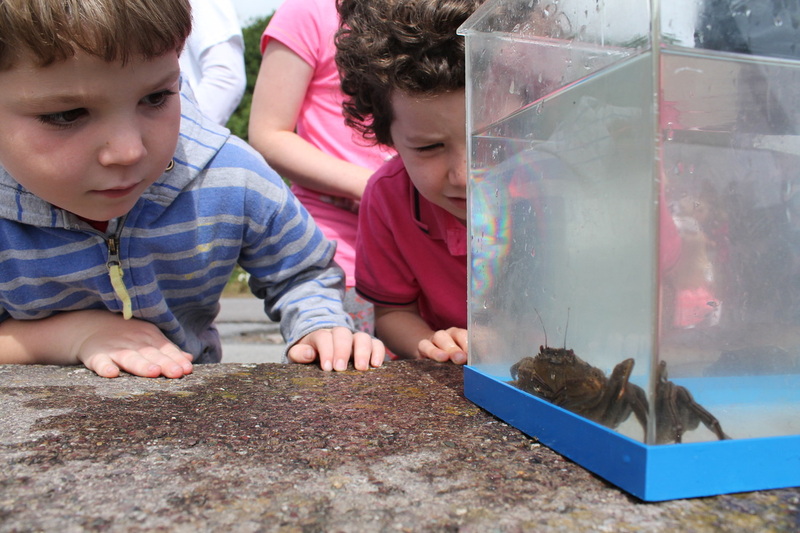 This past Saturday afternoon, Skibbereen hosted its last Heritage Week event here at the lough: touch tanks for the community! Sara and I were getting ready to snorkel at North Quay for interesting creatures for the touch tanks with Kailee overseeing the process. Before Sara and I could even put our faces in the water, a group had formed to ask us questions and see what specimens we had! While we collected specimens and brought them back, Kailee was showing them to the group and talking about them. In the two hours that we had the tanks set up, we had about 75 visitors to the lough. Visitors learned about sea squirts, oysters, scallops, crabs, and sea urchins. At my station, visitors learned about seastars (aka starfish to the Irish) and urchins. Toward the end we had a memorable event that was a cause for education. While one little boy was putting the seastar he was holding back in the tank, one of its arms fell off! The 20 or so people watching seemed horrified and the little boy thought he had broken the seastar but I saw this as a great opportunity to discuss defense mechanisms and anatomy of seastars. We talked about how when a seastar feels stressed (such as being picked up by people and held out of water for a long time), they may drop arms. Usually when a seastar feels stressed, it is because it is being pursued by a predator; dropping an arm may help the individual get away. When an arm is dropped, it still moves around acting like an easier target for the predator allowing the seastar to escape. And as long as any part of the central disc (the body of the seastar) is intact, the seastar will regrow any arms it loses. This made the crowd feel better about our seastar that dropped its arm moments ago. After pulling the arm out to show the crowd, I realized that you could see down the arm and used this as an opportunity to teach the kids about seastar anatomy. We were able to see the pyloric caecum (part of the digestive tract), the ossicles (the hard part of the body that protects the seastar), and the openings to the tube feet (the suction-cup legs of the seastar that help it move and capture food). 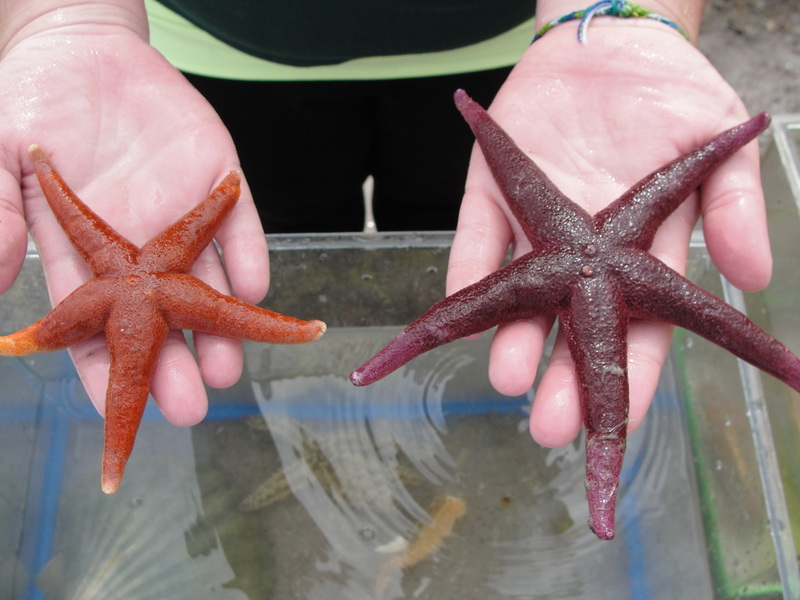 This unexpected opportunity to explore seastar anatomy allowed us to explore how the dramatically different structure of a seastar’s arm (say in comparison to a human arm) is adapted to the habitat in which they live. 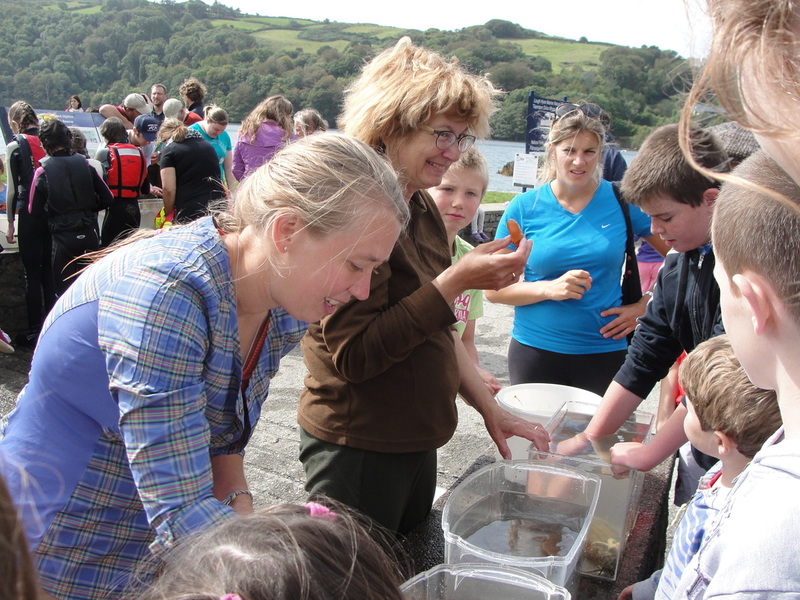 All around it was a great event where kids and adults alike learned about marine life and ecology of the lough. The six of us here have all been given an amazing opportunity, through funding from the National Science Foundation, to participate not only in field research while we are still students but also to experience a different country. Lough Hyne itself is a beautiful, peaceful place, and simply studying here for a month would be a great way to learn about the marine ecology of Ireland and the culture of West Cork. That is exactly what we get to do, and so much more. Other students have posted blogs about the various events in and around Skibbereen that were part of Ireland’s National Heritage Week so I encourage you to read all of those (below). Each event taught us more about the culture and history of this part of the world than I ever expected to come out of this experience knowing. My favorite was the touch tanks because we (the students and mentors) were then an integral part of a Heritage Week event. We helped collect animals from the lough and set them up in tanks for the public to see. We also took turns answering questions and explaining the biology and ecology of the Lough. We are foreigners, which is very evident to everyone by the way we talk (no fancy Irish accent), but Lough Hyne has a rich history of scientists coming from all over the world and the public was happy we were there and able to tell them more about their beloved lough. We are also having great experiences outside of Heritage Week. On a couple of the weekends, we were able to go into Skibbereen for the Saturday market. I have been to Saturday markets in a couple different places in the U.S, but neither of them can compete with the Skibbereen market. There are stands selling everything from food and crafts to small livestock. The food stands are full of freshly baked homemade bread and fresh vegetables. There are even refrigerated stands that sell fresh meat. The craft stands sell everything from assorted antiques and books to hand made jewelry and clothing. 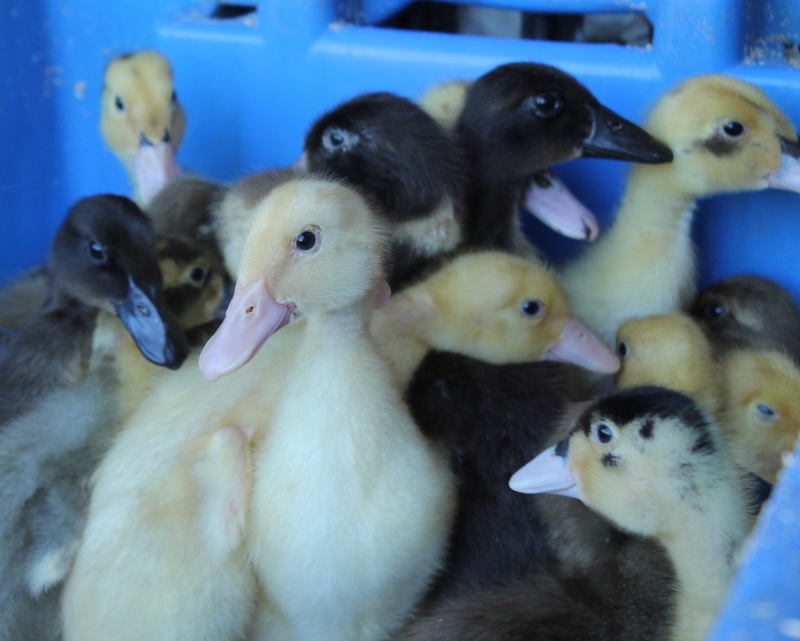 The small livestock consisted mostly of chickens and ducks, with an occasional rooster and even baby chicks. Adults, children, and even dogs were there enjoying a wonderful Saturday morning. Everything I have experienced here has been wonderful, but I think my favorite part was when we went sailing. We were going out into the ocean around Ireland’s southern islands to take offshore plankton tows and we were originally supposed to be on a twin-hulled catamaran, but we ended up on a sailboat (due to engine problems on the catamaran). Before we even left the dock, the crew brought us tea, coffee, and cookies, on real dishes to enjoy as they readied the boat. The skipper had us help with all the ropes to deploy the sails, which was a lot of fun, but the best part was that he let us take turns driving! I have driven small boats before, but nothing that big (the boat was 54 feet long) and never a sailboat. The weather was perfect, though the wind was not very strong so we did have to use the motor sometimes. I was able to drive for about an hour and in that time I had to go through a gap between two islands, which looked tiny as we were approaching it, but turned about to be about three times as wide as the boat. I was expecting the captain to take over as we got closer, but he let me keep the wheel. We went into a different port (Cape Clear ...the site of a world-famous bird observatory) to stop for lunch before continuing home, and I again expected the skipper to take the wheel to park the boat, but he had me do it. It was scary, but not as hard as I had anticipated and it went smoothly. Then we were brought more coffee and tea along with cookies, crackers, cheese, grapes, bread, hard-boiled eggs, ham, and home made scones with jam. It was an unexpected, but delicious lunch! We, unfortunately, did not see any whales while we were out, but we did see lots of different sea birds and some gray seals. I think we all really enjoyed the sampling trip, just as we are all thoroughly enjoying this entire experience. Dr. Cynthia Trowbridge teaching kids about the animals of the Lough. Stand of freshly baked breads at the Skibbereen Saturday market.